Centrally located in Skiathos Town, family-run Babis offers a roof terrace overlooking the Aegean Sea. The hotel provides free Wi-Fi and free shuttle service to and from the port and airport. 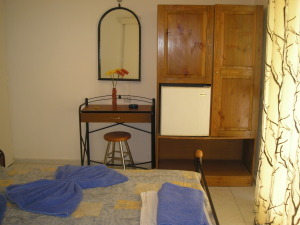 The air conditioned rooms at Babis hotel include a TV and fridge. Each has a furnished balcony and some have views of the port of Skiathos. A kitchenette with a dining area and cooking hobs is included in some of the units. Babis Hotel is located in a peaceful area on top of a hill. A line of steps quickly takes you down to the towns many restaurants, stores and bars. The port of Skiathos is 650 ft away and Megali Ammos Beach is at half a mile. Car and motorbike rental are available and there is free public parking nearby. Είστε ιδιοκτήτης ή διευθυντής στο BABIS; Εγγραφείτε τώρα για δωρεάν εργαλεία, που μπορείτε να χρησιμοποιήσετε για να βελτιώσετε την καταχώρησή σας και να συνδέσετε την ιστοσελίδα σας και το σύστημα κρατήσεών σας.